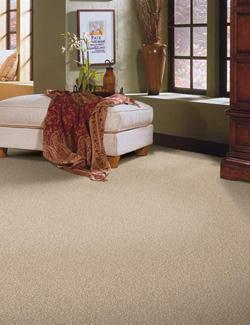 Carpeting is always the right choice for any flooring project. The softness and warmth of this flooring option create welcome ambience in any setting. When searching for flooring for your home remodel, choose The Floor Trader of Jackson over other carpet stores in Jackson, TN. We operate a flooring warehouse where the carpet prices are low, and the quality is high. We have truckloads of flooring arriving at our warehouse every week. As we buy in quantity, our costs are lower, and we pass the savings on to you, whether you want residential or commercial carpet for your project. Count on us to sell you brand-name carpeting from well-known manufacturers. Carpet offers comfort, color, and texture from its tactile and visual appeal. These are just a few of the reasons our customers choose this type of flooring. However, carpeting provides practical benefits, too. It's durable and long-lasting, as well as easy to clean and maintain. In our warehouse, we offer hundreds of different options in the brand, color, and fiber. When you have trouble making up your mind, just ask one of our flooring experts for assistance. These professionals have design training, as well as product knowledge, so are well-equipped to help you choose the right carpeting for your building project. Carpeting is no longer a delicate decoration that no one can step on. Today's manufacturers make high-performance carpet that withstands stains, spills, pets, and foot traffic. Let us help you find carpeting that keeps its color, maintains its nap, and always looks handsome. Rest assured we have exactly what you need in stock. We're a cash-and-carry outlet. In addition to carpeting, our outlet carries a pleasing assortment of area rugs in a wide range of choices. Select the brand, size, shape, and color that meet your needs. In our opinion, every room requires an area rug. Rugs give a room a finished look, splash of color, and touch of elegance. Rugs organize a space by allowing you to group furniture together, such as setting up a conversation area in a corner, defined by a handsome rug. They also serve the very practical purpose of keeping furniture legs, high-heeled shoes, and pet claws from damaging the flooring. Stop by our warehouse to see our selection. Contact us today for information on the brands of carpeting and area rugs we carry in our flooring outlet. We proudly serve homeowners, builders, contractors, and flooring installers from Jackson, Three Way, Spring Creek, White Fern, and Beech Bluff, Tennessee, and the surrounding areas.